Fans of romantic comedies, rejoice! The sequel to a fan favorite is coming to set our hearts aflutter. 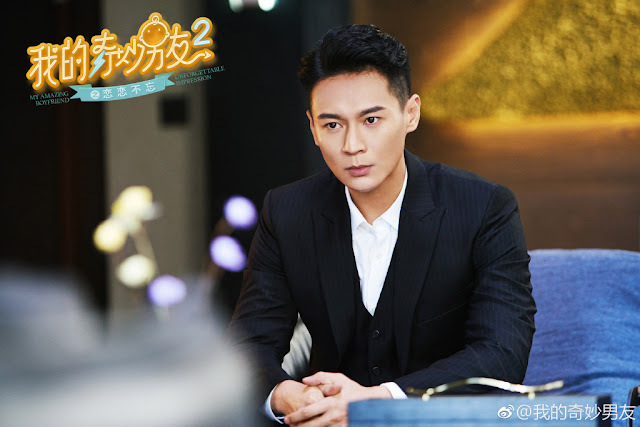 My Amazing Boyfriend 2: Unforgettable Impression 我的奇妙男友2之恋恋不忘 stars Mike D'Angelo and Esther Yu Shuxin as Xue Lingqiao and Tian Jingzhi. This funny love story is based on the novel of the same name by Shui Qian Mo and runs 28 episodes long. Synopsis from www.chinesedrama.info: Tian Jingzhi becomes pregnant with Xue Lingqiao's baby. Out of concern for mother and child, Xue Lingqiao quietly moves in next door. Along the way, Tian Jingzhi meets Yun Zhen (Li Geyang) and finds that they get along really well. 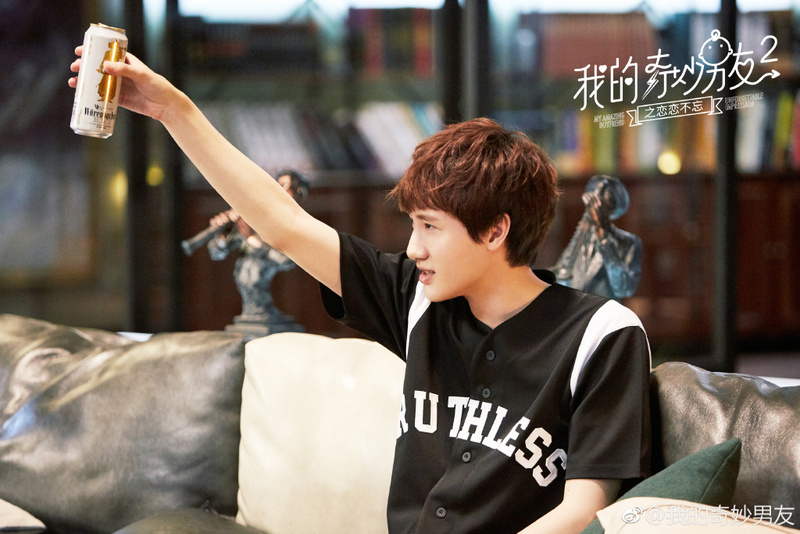 Yun Zhen feels the same way and he begins to pursue her romantically. Meanwhile, the S Organization led by Qiu Yuebai (Liu Guanxiang) learns about Tian Jingzhi's pregnancy. Qiu Yuebai uses the identity as a relative to get into contact with her all while scheming to use her for his own gain. At the same time, a case starts brewing as women in the city begin to disappear mysteriously. Sadly, the original cast could not return due to conflicts in schedule or some other circumstance This is especially true for Korean actor Kim Tae Hwan as China's ban on Hallyu content was ongoing at the time of filming. Good news for fans though since they chose Thai actor Mike D'Angelo to take over. He seems to have developed very well in China as actor. Yu Shuxin takes over Janice Wu's role in the first series and simply put, Janice owned that role. It may be hard for her to avoid the comparison. To coin a phrase, "Those are some cute shoes to fill." From the looks of things though, My Amazing Boyfriend 2 seems to have at least the same quality as the first series. And at least this time, Tian Jingzhi and Xue Lingqiao are going to be happy together. They are joined by Li Geyang, Tian Yitong, Fu Jia, Yang Yifei, Wei Zheming, Yang Zhiying, Liu Guanxiang. No no no no no!!!! I loved the first one....it was wacky and did not take itself seriously. The two leads made the show a long with the ex boyfriends. They really should not even make a sequel if they can't have the two leads back!!!!! arrgh! So frustrating...they could have waited another year and get Kim Tae Hwan back! I'm excited for this sequel. Of course it is sad, that we can't have the original cast but what I have seen from the trailer Esther does a god impersonification of Janice Wu's acting style in this Drama. And to be honest, Mike surely is a better actor. KTW's acting often was a bit wooden even in scences when it wasn't neccesary. That he is an eyecandy too surely will help him to get accepted. Since most of the other actors reprise their roles (I adored Shen Meng Chen) I'm sure it will be turn out nice, as long the script and the directing is okay. I saw the trailer, the Main Lead actor is not even giving off the same vibe as the original. The whole point was how calm and poker face the main lead is that is in sharp contrast with the Main Lead actress. I am still disappointed. I thought she was pregnant when the first season ended, the trailer doesn't seem to be continuing the baby story...or maybe I missed it during the trailer. I could not finish the first season, although it had entertaining elements. I just could not stand the main character. She was very self-absorbed, oblivious to her wrongs, and kinda mean to the lead guy. She did have sweet scenes but did not compensate for her crappy personality. Sorry, not sorry. Mike is a better actor than Tae Hwan, but he's much more emotional in this trailer compared to the stoic first season. Youtube has the eng sub the day it is release. SO far I like it. Give it a chance. I really enjoyed the sequel! I think Esther Yu is a comic genius. Made me lol every episode sometimes without saying anything.